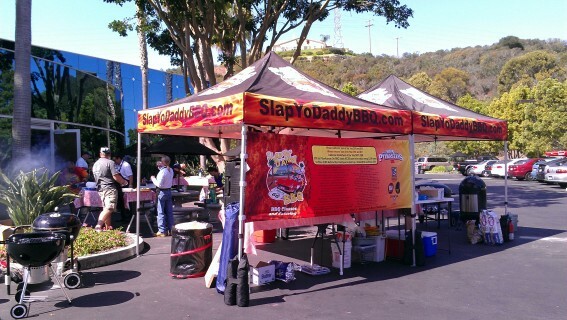 The buzz had been building for months as employees of the largest veterinary imaging company in the US eagerly awaited the Slap Yo’ Daddy Fire and Fun corporate training camp held at the Sound-Elkin headquarters in Carlsbad, north of San Diego in August 2012. It was wonderful to share our love for BBQ with 17 Sound-Elkin executives and employees who flew in from around the country to attend. They were all treated to a unique and fun training session without suffering the usual death by Powerpoint training seminars. Corporate dynamics such as Planning, Strategy, Time, Budget, Quality, and Risk Management were not covered in a usual classroom setting but experienced by the attendees amid the fire, smoke, and heat of barbecue competition. Most importantly, the goal was for everyone to have fun while immersing themselves in a BBQ class. It was held outdoors in the Sound-Elkin parking lot and the judging of the entries of the teams were done in the main corporate building. After a short course to learn how prepare championship BBQs, everyone was broken into teams of 4-5 employees. There was a pantry of ingredients and sauces for the teams to use and an igloo of barbecue meats which they were to cook on the Weber grills. They also had to light their pits and maintain good fire control for even cooking temperatures.